Based on the prescription published by the doctor, we prepare medicine. At that time, depending on each patient, we confirm whether there are any medicines taken together that should be avoided (combinations that strengthen or counteract the effects or that cause undesired side effects) and whether the medicines that have caused side effects so far are prescribed. This is an important confirmation in order to use medicine safely. Please be sure to advise your doctor or pharmacist if you currently have other medications or supplements or if you have experienced side effects due to medication so far. For outpatient clinics, our hospital issues an out-of-hospital prescription. Please receive medicine at dispensing pharmacy outside the hospital. We will go to the bedside of the hospitalized person and give medicine that we dispensed based on the prescription of the doctor. 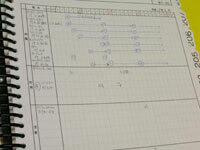 At that time, we will explain the effect of medicine, how to use, cautions etc. 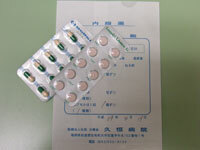 We also check the status of the effect and whether side effects have not appeared since using the medicine. We would be grateful if we could contribute to your medication in cooperation with other staff, such as doctors and nurses. If you have any questions or concerns about medicine, please do not hesitate to ask. We collect a variety of medicine information and provide the information not only for patients who are hospitalized but also to our medical staff, such as doctors and nurses. 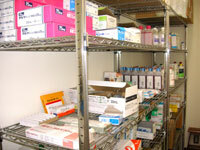 We always check the storage conditions, such as room temperature and shading, and expiration date so that we can not only use reliable medicines stocked in the hospital but also ensure efficient inventory management free from inadequate or wasteful inventory.